Article first published as Book Review: ‘Rope’ by Maria Ketsia Theodore-Pharel on Blogcritics. “Rope” by Maria Ketsia Theodore-Pharel is the first book in the Grace Donner Trilogy. The story begins in 1925 during the U.S. occupation of Haiti. Colvin Donner is a U.S. Marine tracker, sent to capture the elusive rebel hero, Chango Champagne. While tracking Champagne, Donner spots a village woman, Poupette, and believes her to be a part of the rebel movement. After a vile confrontation, Donner thoughtlessly casts Poupette aside, but the encounter will shape the families of both parties for generations. Six long months later, Donner catches and hangs the rebel, but not before Champagne calls on his ancestral warriors, cursing the rope. Tragic events involving the cursed rope drive Donner back to Haiti in 1945, to the town of Croix des Bouquets, just outside of Port au Prince. It is in Croix des Bouquets, where he and his son Robert engage in evangelism, and Robert meets Moiselle, a young country girl with dreams of leaving Haiti. Robert and Moiselle, after some struggle, settle down to make a life together with their farm and three small children, Grace, Ester 4:14, and Robert, Jr. Circumstances surrounding the past catch up with them, and they find the cursed rope to be an evil greater than anything that could ever be expected. Laced with history surrounding the uprising of rebel forces, and the U.S. occupation of Haiti after the murder of dictator, Jean Vilbrun Guillaume Sam, the story is as educational, without meaning to be, as it is captivating. Born in Port au Prince and raised in Croix de Bouquets, the author eloquently documents a chilling tale of the delicate balance of life for Haitians during an important part of the history of the country. In addition to historical elements, are threads of magical and mystical realism, which will appeal to fans of the fantasy genre. The author meticulously captures the essence of the people through their daily interactions, rituals, and beliefs. The characters are phenomenal, both protagonists and antagonists realistically portrayed in the era. The development of Grace Donner throughout the latter part of the story creates a natural flow to the next installment of the trilogy. The only thing that detracts from the book, in my opinion, is the formatting. Double-spaced, and with minimal margins, the layout leaves the impression of reading a draft instead of a finished product. While this does not affect my thoughts about the story, it does diminish the overall reading experience. 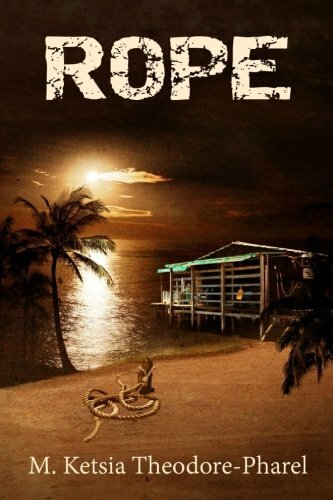 Overall, “Rope” by Maria Ketsia Theodore-Pharel is a passionate, bold, and engaging read that will leave readers in anticipation of what happens next. I look forward to seeing how the plot continues to unfold in the upcoming novels and give “Rope” an enthusiastic four-star review!